January | 2008 | What's in a Smile? I only have 1 more month to go! And I started this journey 11 months ago. The original estimate was 12 months, and amazingly, looks like we’ll be on schedule. I’m thrilled about this, as you might imagine, and am getting prepared. How do they feel? Since that back molar bracket was popped off, the braces have been a breeze. No discomfort or irritation at all inside my mouth. Hallelujah; better late than never. Elastics: I’ve continued to wear the Chipmunks, mostly at night. My last month of helping out with my bite. I’ll work on maximizing elastics this last month, because after the braces come off, it’s all a slide back to the old way. Flossing: The power chain elastics have made it difficult to floss some teeth, especially across the top where the band is under the arch wire. I had been getting a bit lazy about the flossing; as with elastics, want to focus on this more diligently. Have to use the threader a lot. Flouride rinse: I don’t recall writing about this for a while. I’ve been pretty good about rinsing after flossing, at night, before going to sleep. Still happy with the Tom’s of Maine brand. Eating: Nothing has changed. Still staying away from nuts, super-chewing, and too crispy. All things I’m eagerly anticipating post-braces. Smile: I’m flashing my braces smile to some friends, letting them know that next time they see me, I might be braces-free. I’ve met some new friends who only know me with braces; I wonder if I will feel shy about my non-braces smile? Month 11 photo. Not much has changed. I’ve been reading the braces removal stories on Archwire. So I’m really excited about getting them off. But I can just as easily attach myself to something to worry about, if I’m in the mood. Like, what if my teeth move again–like they did in the 25 years since the first time I got my braces, and didn’t wear my retainer all the time? Or what if there’s discoloration on my teeth? So it turns out they gave me the wrong kind of elastics last time. Thailand = Impala, not Chipmunk. I’m back to Alvin and his buddies for this last stretch of elastics. Today was my penultimate braces check-up. Well, hopefully, that is the case. Unless something truly strange happens, they will yank off my braces on my NEXT appointment, one month from now! Some fear about the process of yanking off the braces. Have read that it can be painful. What if I don’t like the way my teeth look when all the metal is off? Yippee! I can start the rest of my life with a healthy bite that also looks great! And I can eat the crisp and chewy things I’ve been avoiding this part year! And, I’m going to miss writing this blog. I’ll continue to write about the retainer, etc., but it won’t be the same. Hmm. So I’ve been thinking about what might be fun to do in this transition time. Maybe invite some of you readers to share your stories? I wrote a while ago that the chipmunks are out. They’ve been replaced by Thailand (Dentsply SH4 Elastics). Obviously, this company goes with a country-theme. Curiously, they are made in the USA; the chipmunks are mexicanos, on the other hand. I miss the animals. Way more cute. Anyway, another difference is that the Thailand elastics are thicker (4mm, 3/16″, 6 oz. versus 1/8″, 3.5 oz for the Chipmunks), and feel stronger. They told me it’s the same, but it feels different, and look different! What do you think? All braces newbies! Go to your local Walgreen’s (if you have one) and invest in a Magic Bullet! They are only $49.99 after you mail in a $10 rebate. And you don’t have to wait to get it shipped from somewhere else. Before I get too carried away, What is the Magic Bullet? you ask? It’s the braces wearer’s best friend. Friendly mushy food quick and easy, with lower maintenance cleaning than using a blender. Read my earlier post where I expounded the virtues of this infomercial product. But unfortunately, NOT braces-friendly. It’s not the eating/enjoying part. 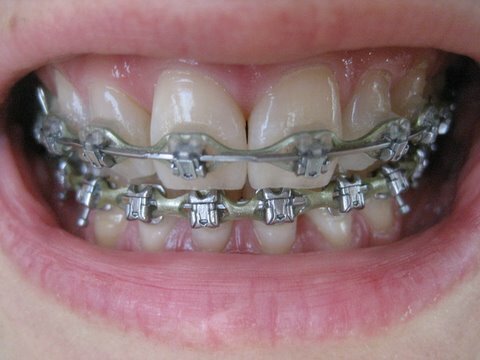 It’s afterward when those little pieces get stuck in every braces bracket nook and cranny. So, just to share a suggestion. Make sure you have plenty of time to rinse your mouth and floss after you eat one of these fruits, because little pieces will get everywhere. springs and coils, oh my! Someone (Cassandra) asked me if I’ve had springs and coils during my treatment. Fortunately, no. Not that I know what those feel like, but I imagine they are additional torture methods. At any rate, my basic understanding is that they help move teeth–open up spaces, etc.–and when teeth move, it hurts. Plain and simple. If any of you out there have experience with springs and coils and would like to share with the community, please do! Just heard this short feature on NPR, talking about cosmetic dentistry. “Every decade over the age of 30,” [Dan] Deutsch says, “you show a millimeter less of your front teeth.” Everything starts to sag a little, and the elasticity in the skin around the lips isn’t what it used to be. So, as gravity pulls its weight, more of the bottom teeth show. “It’s an older look,” Deutsch says.